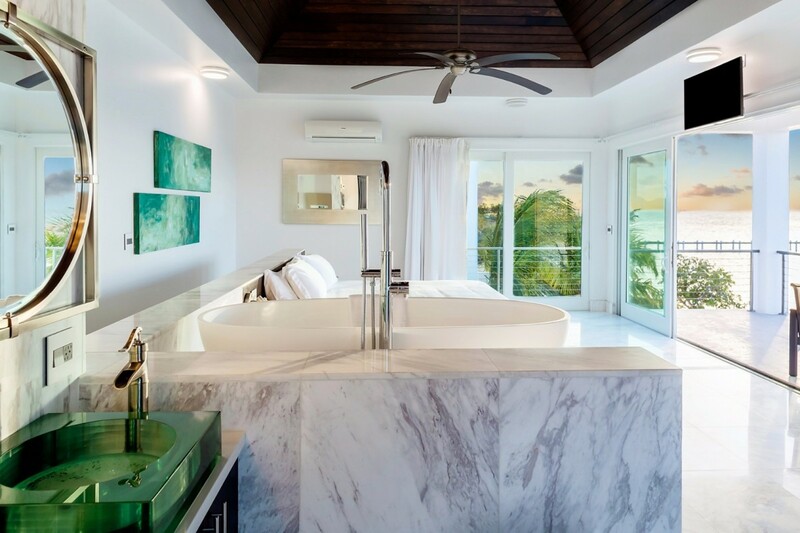 Villa Capri Turks and Caicos. 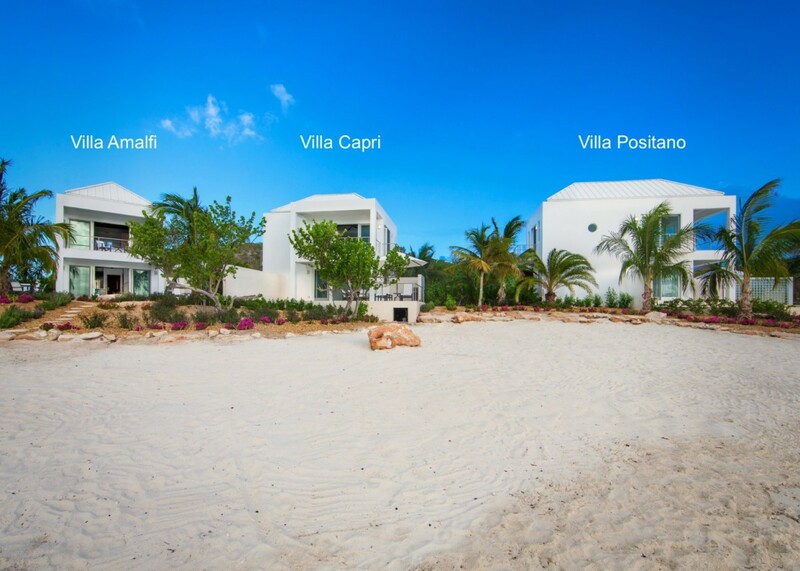 Welcome to Sapodilla Bay, where Villa Capri waits for you and your beloved. This one-bedroom vacation rental is the perfect place to create a little romance or rekindle the fire together. 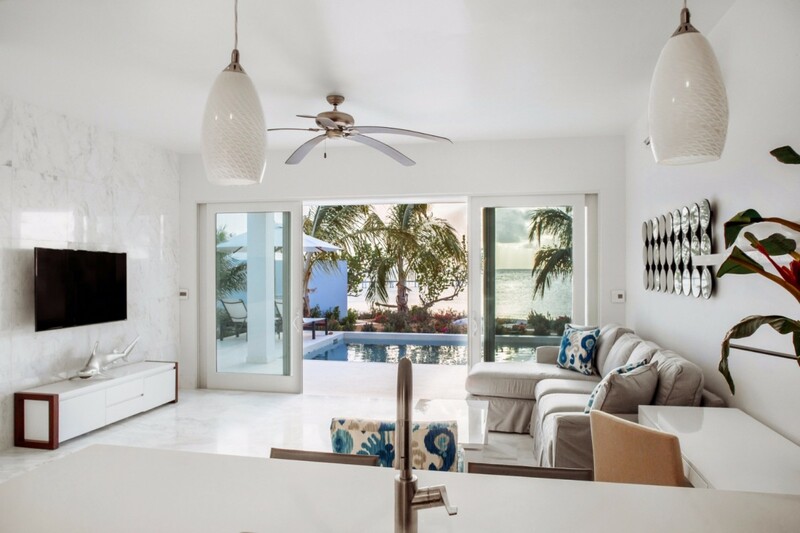 With the stunning view of the water just outside your door, the gentle sound of the ocean breeze flowing through the house, and the relaxed island ambience helping to wash away your worries, you’ll be able to connect like never before. 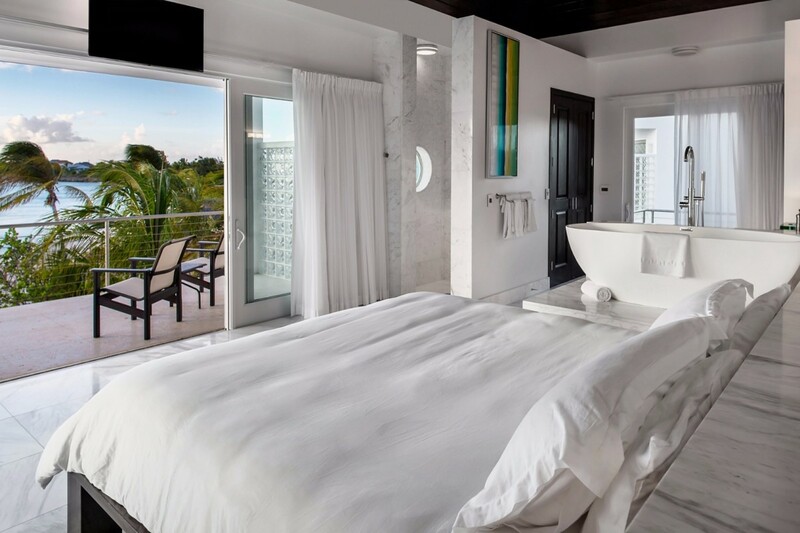 Start your day on the private balcony located off the upper floor master suite, or take a dip in your private pool. During your stay, you can take advantage of the nearby tennis courts, or explore the beautiful islands by boat – they’ll pick you up right outside your door! When you’ve had your fun, you can return to Capri and be whisked away to a hidden world all your own. 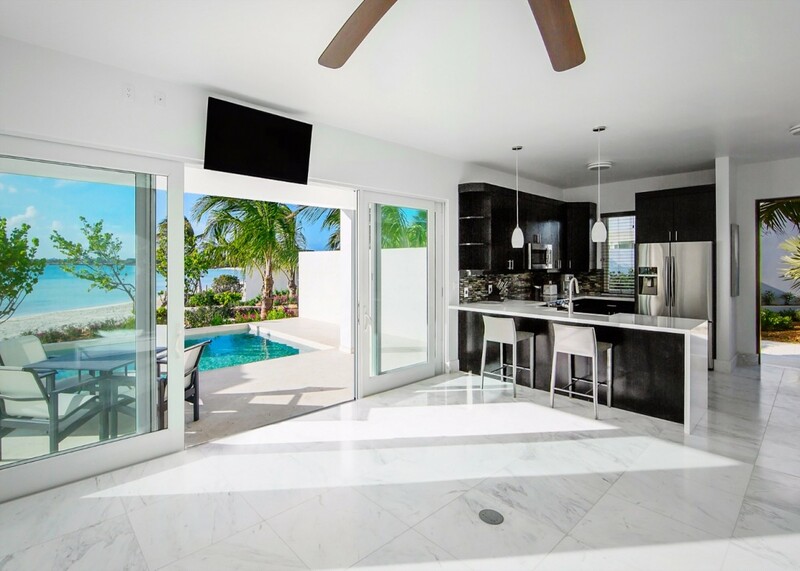 This villa includes all the modern amenities you need to lock the world away, including a gourmet kitchen with cooking supplies, cable TVs, laundry facilities, Internet, and more. Or you can simply lounge on the terrace, where the luxury sunbeds make the perfect spot to catch up on your reading or work on your tan. It’s just a quick walk to the beach where you can enjoy the gentle tides and the white sand as well. Finish your day with a delicious dinner at the nearby restaurant Las Brisas, and never worry about lifting a finger while you stay. You’ll have housekeeping and a pool maintenance person on hand to keep your place cozy and comfortable. 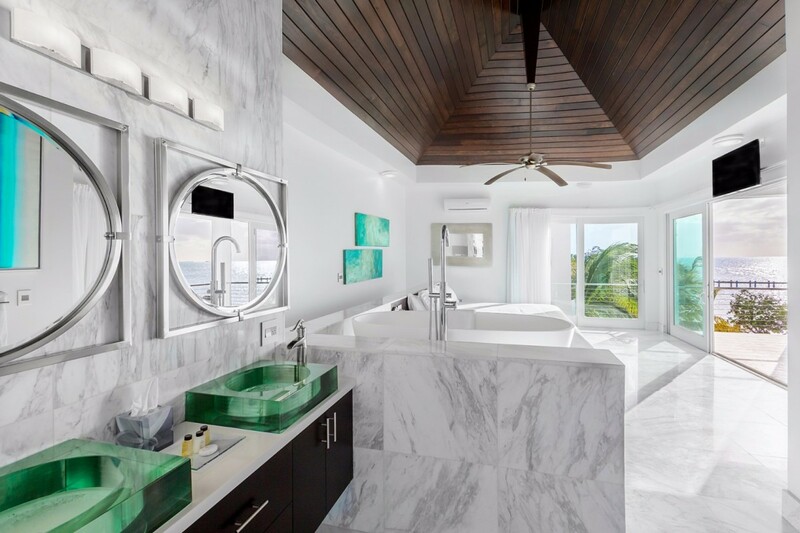 From the marble floors to the wood peaked ceilings, this villa is the epitome of luxury for just the two of you. Let Capri become your annual getaway together, or surprise your loved one with a once-in-a-lifetime tropical trip this year. Please note that the villa has a final cleaning cost of $235 plus 12%. 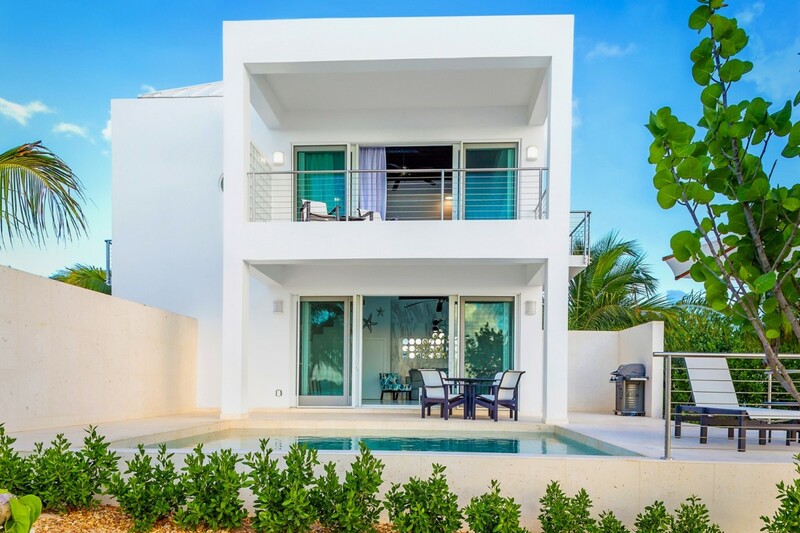 The Sapodilla Bay villas are a cluster of three identical villas. From the water and looking at the villas, villa Amalfi is on the left, villa Capri is in the middle and villa Positano is on the right. Bedroom 1: Bedroom with a king-size bed, A/C, ceiling fan, private balcony with sea views and en-suite bathroom with bathtub, shower, double vanity and WC. 2 guests maximum. Cancellation Policy: For cancellations greater than 91 days prior to arrival, US$250.00 is forfeited. Cancellation less than 90 days, 100% of gross rental is forfeited. Please note all Christmas and New Years reservations are non-refundable. My husband and I just returned from a week spent on Sapodilla Bay in Turks and Caicos at Villa Capri. It is one of three Villas in the Sul Mare Villa units. This was our first time to the island. We were a little nervous coming into this trip because there were not a whole lot of reviews on this Villa specifically and I am used to doing quite a bit of research before we book anything. I like to see travelers photos too so that I can see if the hotel or villa matches the online pictures. I wish there was a way for me to attach the photos I took during this trip. You would see that this is a very beautiful place to say and the Villa and beach are just as described in the advertisement. 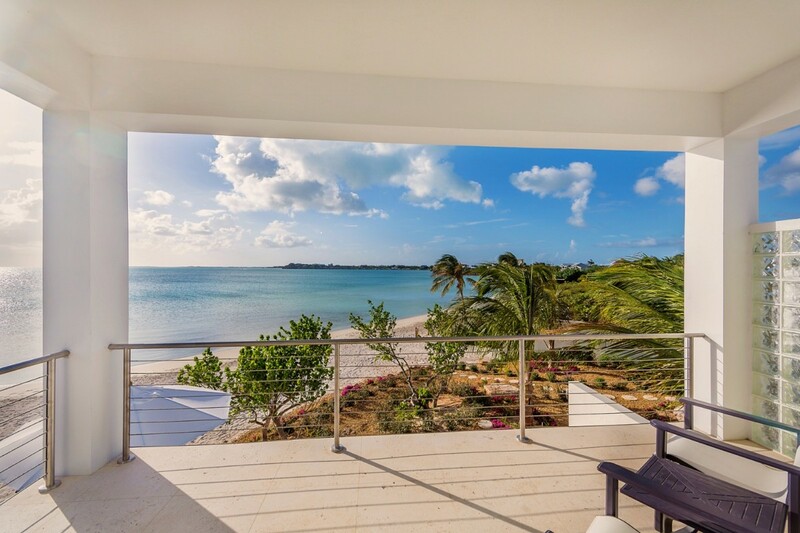 The location on Sapodilla Bay is for couples and families who want to rent villas on a small, quiet beach. The water is very shallow which is excellent for small children. The water is crystal clear and the sand is like powder. This area of the island is about a 25 minute or so drive from the Grace Bay Area where all of the resorts and restaurants exist. You would definitely need to rent a car. The driving is not easy in this area, especially at night so be aware of that issue. The roads are unlit and in poor shape. Once you get closer to Leeward highway the driving is better. The Villa is only 10 minutes from the airport and there are several grocery stores near the airport, not necessary to go to the large IGA in the opposite direction. As for the Villa itself, I cannot think of one thing I would change or suggest. It is beautifully decorated, has nice appliances in the kitchen, the air conditioner works great, nice ceiling fans, the bed is very comfortable, the shower has a gorgeous window view, the towels are soft, the views from both levels are like out of a magazine. It is hard to believe how beautiful the ocean and beach are and that you are steps from it. There is a grill, floaties for the pool and beach, a cooler, several pieces of snorkel equipment, very nice beach chairs to take along to explore other beaches, a 2 person kayak and a SUP. The kitchen is stocked very well with 2 different coffee makers, coffee filters, spices, a few condiments were left in the fridge, olive oil, paper towel is provided, dish soap, dishwasher pellets, hand soaps by every sink, plenty of toilet paper. There was plenty of laundry detergent and drier sheets. They supplied several shampoos, soap, conditioner, body lotions. Sapodilla Bay is a very relaxing beach without crowds. It is a public beach though so keep that in mind. We never felt that we couldn't walk away from our beach chairs and have any of our items disturbed or not safe. The section of beach that these 3 villas are on is at the very end of the beach where people don't tend to congregate. At the opposite end of the beach there is a guy that sets up a grill and has jerk chicken, fish, hamburgers and hotdogs for sale. There is also 2 little bars set up to buy alcoholics beverages. They also have chairs and umbrellas and jet skis for rent.Sundays are the only busy day on the beach. There is one restaurant just down the road called Las Brissas. It is the only restaurant nearby. This is very easy to find and has a very good menu and usually some kind of live music each evening. The daytime views of Chalk Sound from this outside patio restaurant are amazing. The water color of Chalk Sound is undiscribable. It is a must see. I would highly recommend staying at any one of the three Sul Mare Villas. We both thought the Capri villa located in the middle was ideal. But we are biased due to just having spent 7 nights there. It was a dream vacation. Don't hesitate to book this trip, you won't regret it. Isle Blue was quick to respond and easy to work with. My wife and I spent our 30th anniversary at Villa Capri. We can't say enough on what a great property and location this is. Highly recommend for a relaxing vacation with your significant other. Security: We always felt safe in this location. The Villa property managements along Sapodilla Bay provide 2 friendly security officers that patrol on foot all night long from 6 to 6. The unit has a safe that is large enough for most laptops. Location: The drive from airport is very short at 15 minutes. 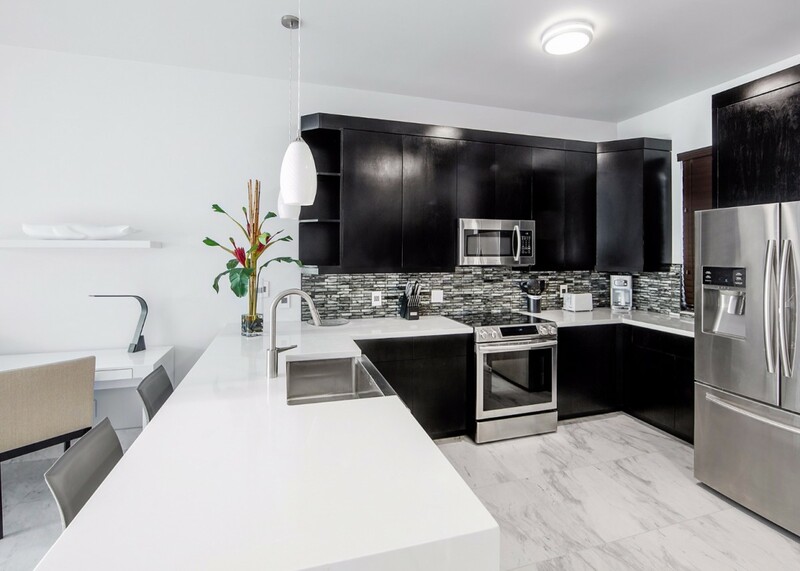 20 minutes to nice IGA grocery store and 25 minutes to Grace Bay restaurants. This property has everything you need. It's private and very quiet, yet close enough to all of the touristy spots. All of the conveniences you would expect: washer/dryer, hair dryer, iron, blender, bose outdoor speaker, Keurig coffee maker. The mid week housekeeper was a nice bonus. Can't wait to come back to paradise! Villa Capri was perfect for my husband and I. It was a much needed vacation away from the everyday chaos. We went kayaking every day and used the paddle board several times. Having our own pool was great. Sapodilla Beach is definitely our favorite! We highly recommend the Villa for a wonderful, relaxing vacation. 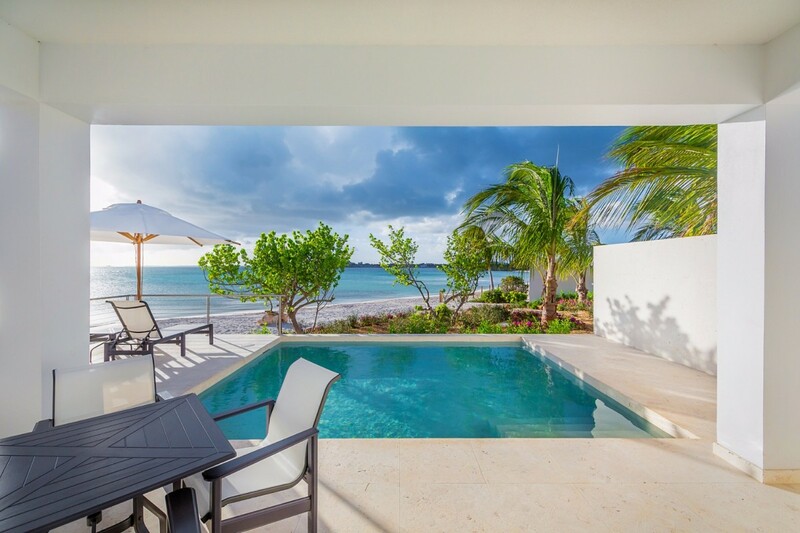 We recently stayed at Villa Capri on Sapodilla Bay. What a wonderful experience! 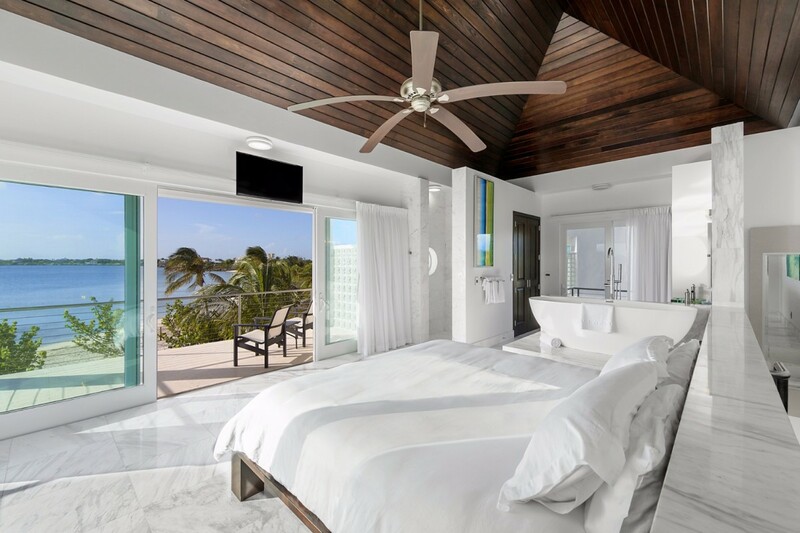 My husband and I always have difficulty finding a one bedroom, stand-alone beachfront villa in the Caribbean. We finally found a terrific one in Villa Capri. The house is very modern, bright, and airy. 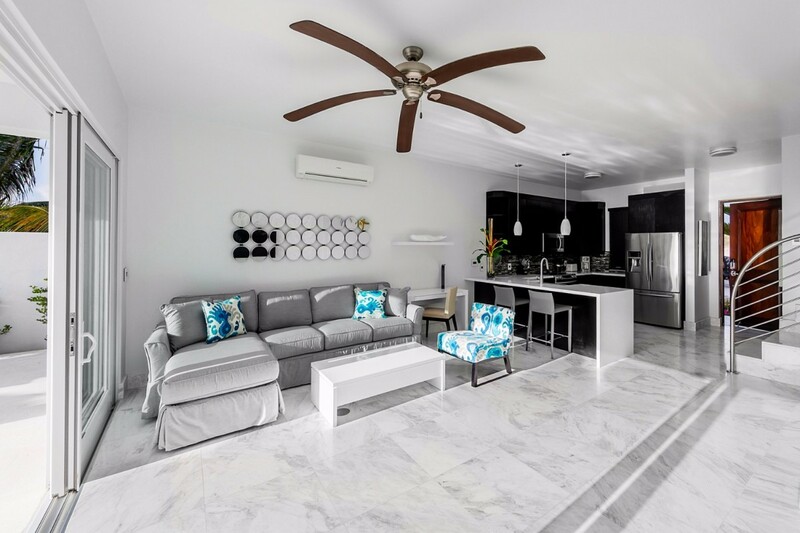 The location at the end of Sapodilla Bay is very quiet and relaxing, yet only a 15 minute drive to the many wonderful restaurants on Grace Bay. The owners and property manager were very responsive to any of our requests and were a pleasure to work with. We would definitely rent this villa again. We loved this special place of pure paradise. The villa is amazing. We loved the privacy, sunsets, beach, pool, everything. We will be back. My husband and I spent our honeymoon at Villa Capri from July 17-24. To say the location and villa are beautiful is an understatement! The location on Sopadilla Bay could not be more perfect. From the shallow, calm, turquoise water (and powder soft sand!) to the spectacular sunsets the location could not have been better. It is a quiet area and almost felt like we had our own private beach! The villa itself is beautiful, too, and provided everything and more that we needed for the week - including a washer and dryer! We will always have very fond memories of our time at Villa Capri and can't wait to come back! My wife and I stayed at Villa Capri for 6 nights from June 27. What can I say to sum it up – it was amazing...the property itself, the location, the water, the island itself. We are now back home in Australia and we’re still day dreaming. Villa itself – it was luxurious, and it impressed the hell out of my wife. The beautiful bay and water right in front of you, downstairs or upstairs you can see and get lost in the view. Very nice salt water pool also. We were not left wanting for anything at the villa in terms of amenities etc etc. Did some groceries and had breakfast outside all but our first morning and a couple of BBQs for dinner. If you are missing anything, well I’d be surprised. Location – gorgeous, gorgeous bay with amazing clear blue water just steps from your villa. We were seriously gobsmacked and we have been to some beautiful beach destination and islands in our time. Pier really close and lots of turtles to be seen, and sting rays, in the morning. Other – You are provided with a cell phone which is really handy and if you ever have any issues at all, the property manager is onto it asap. No fuss or hassle. 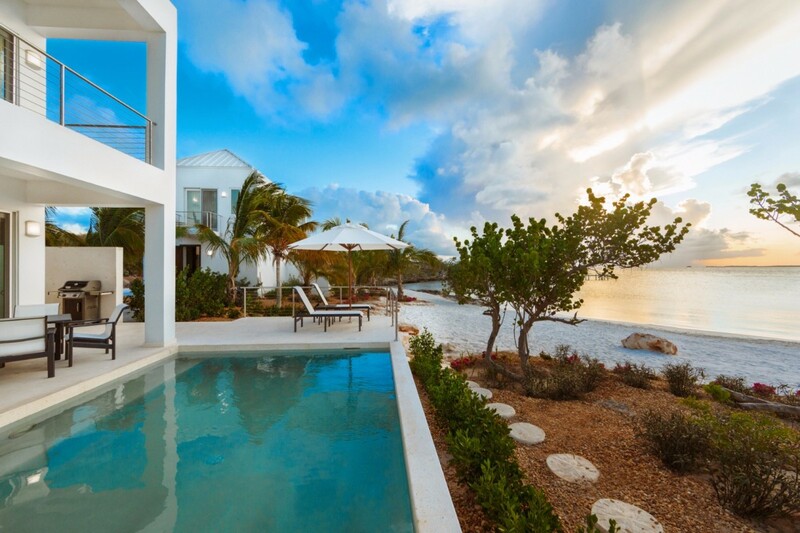 If/when we come back to TCI’s we will not hesitate to stay at this villa!